On the 14th of July our Abbey Singel was born. Based on a Papazian recipe, this was a mini-mash/extract with Pale DME and Aromatic & Crystal Malts and mix of Challenger (Bittering), Saaz/Northdown (Flavoring) and Saaz (aroma) in a 60 minute boil. It was a 5 gallon batch pitched with Wyeast Belgian Abbey Ale liquid yeast starter pack at an O.G. of 1.053. With an F.G. of 1.012 we bottled 8/25/12 for a projected ABV of 5.4%. Looking back at the time lines this seems longer than I'd planned, but this brew wasn't unleashed until 9/19/12. I'm a bit sad we won't know how it tasted in the early days but it sure delights now! Thar she blows! 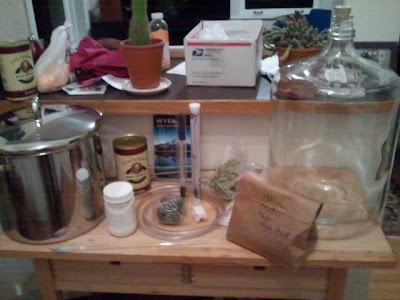 My original setup was procured on 1/21/12 from one of the fabulous Local Homebrew Stores in Seattle - Bob's Homebrew Supply. It's been a trusty format for learning the ropes and making some mighty fine brews in the process. It was also fun carrying all the gear home on the bus - we got some great attention and knowing glances. People in Seattle know their homebrew kit. I'm essentially still brewing with it (pending the new build). 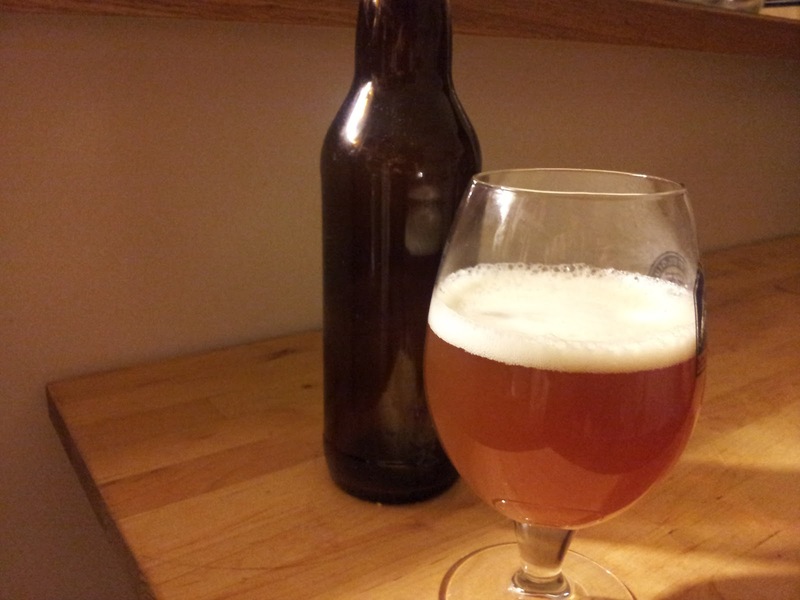 Batch #10 just went into the fermenter last Sunday, its an experimental IPA which I have high hopes for - more later. I've loved the convenience of brewing in my kitchen, but an ever increasing vision, a burning desire for learning and expansion and a recent introduction to the boil-over have me yearning for a bigger and better system. I've got a 3 tier gravity-fed keggle system in the works and I'll post about that soon. Maybe it will come out as a multi-post affair for ease of digestion. As a cautious beginner I wanted something in the way of hand holding for my first batch. But my intrepid sense of adventure wouldn't allow for just any cookie cutter step-by-step guide. As a brewer I've found myself reading all manner of instructional books, articles and forum posts (the first of many shout outs to Homebrew Talk). It is great to launch yourself into a new hobby obviously, and thanks to the likes of Charlie Papazian, John Palmer and myriad other pioneers and associations there's an embarrassment of riches for the new homebrewer to draw from. I had previously skimmed parts of The Complete Joy of Homebrewing Vol. 3, Papazian's legendary tome, a few years ago, following a misguided attempt at a Victoria Bitter kit from my Local Homebrew Store. Now don't get me wrong here, I've nothing against homebrew kits; they are a great gateway for new brewers. But I was young. I was impatient and I was sloppy. I remember fondly hoping (in vain it turned out) that my mother's stock pot would have enough capacity for our boil. I remember how cavalier we were about cleanliness and near ignorant we were about sanitation. We did it though, me and my mate Pete made 'our' beer. It didn't matter at the time that we oxygenated the inoculated wort or that we primed each bottle with a dry and very roughly estimated teaspoon of regular white sugar. It was fun, it was new, it was 5 gallons of beer all for ourselves! 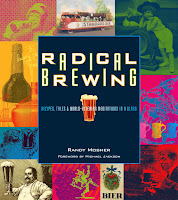 Notwithstanding these digressions, in stepped Randy Mosher and Radical Brewing in the form of a timely anniversary gift. 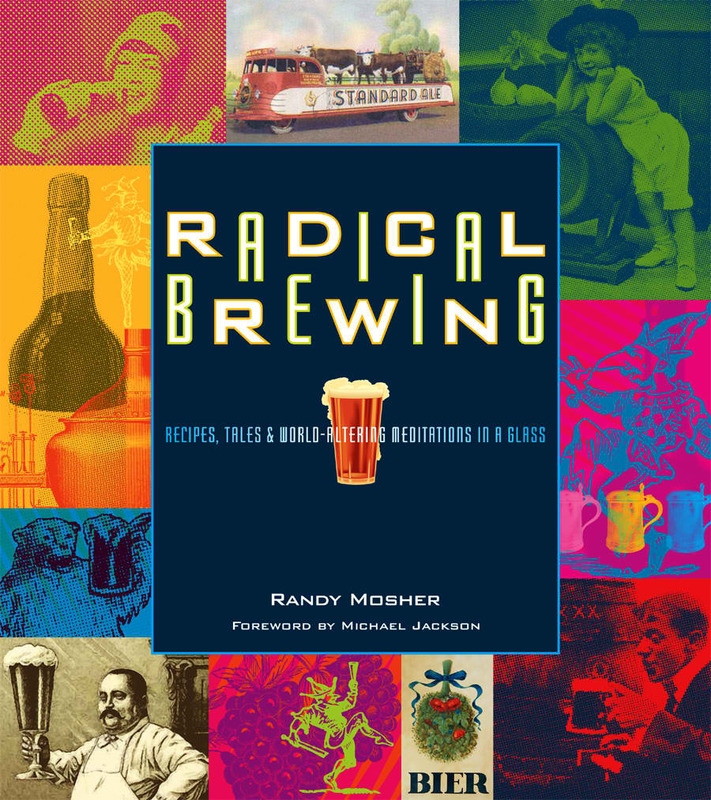 Mosher puts an interesting slant on brewing, with an engaging brief history laden with off-beat facts and a daringly atypical recipe list incorporating unconventional and exotic ingredients such as habanero peppers, chai, cardamom and henbane. 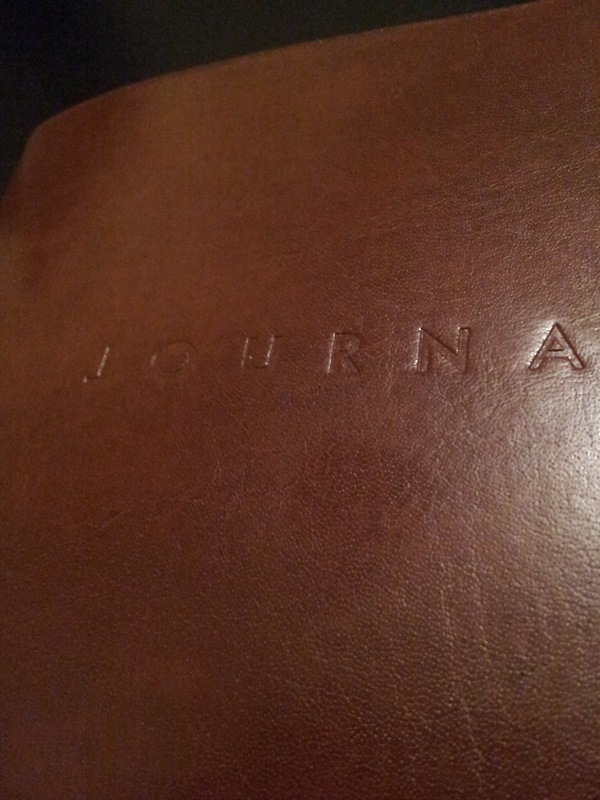 More important for my needs at that juncture however, was the style of the first timer's guide it contained. Entitled "Your First Radical Brew", Mosher gives the novice a helping hand, but wide margins within which to work. Instead of an ironclad recipe, you get a ranges of ingredient amounts and the freedom to toy in between the lines to create your first golden/dark American ale. Mine ended up something of a dark porter. I felt like going all out on dark ingredients and plumped for 6.6lb Thomas Cooper's Dark Liquid Malt Extract, added after steeping 12oz Crystal Malt 135-160 Lovibond up to 200°F. I also decided to get local and hop it up with 8oz of 8.8% Alpha Acid Cascade hops added in quantities of 1/4 at 60 minutes, 1/4 at 20 minutes and 1/2 at the end of the boil. A direct pitch Wyeast activator was used to inoculate the wort once temperature was between 70-80°F. Cooling time was and remains one of the more contentious parts of my brew days (until the impending purchase of an appropriate heat exchange device is made) and my process is pretty much an ice bath. This method is both frustratingly slow and a contamination risk. I am looking forward to adding some form of wort chiller to my set up at the nearest convenience. The yeast was pitched at room temperature onto a wort of 1.040 gravity, giving it ample opportunity to produce a tasty and mid-range alcoholic dark ale. My first brew was a great experience, and I enjoyed taking on what I then perceived as the ultimate nuts and bolts of brewing so soon after deciding it would be a cool thing to get into. I revelled in the timing, the method and the thoroughness of sanitizing (all my gear was new so it was just a case of a quick rinse and then a soak in my newly-acquired one-step sanitizer). It all seemed so involved and in a real sense a daunting exercise full of imperative steps that I would eventually learn (the hard way) to find ways not to omit. A somewhat humorous incident occurred during gravity testing to assess the end of fermentation. On 2/5/2012 and 2/6/2012 I got steady readings of 1.009, indicating the end of fermentation. Unfortunately prior to my third, and to be final reading - 2/7/2012, I made the error of resting my hydrometer horizontally on the counter. Either the hydrometer came alive or the rumors of my counter-top's level have been greatly exaggerated as it deigned to roll off onto the ground and break in half. I was stricken, how could this have gone so wrong? After some agonizing (where does one acquire a new hydrometer at 9pm on a Tuesday? ), I employed the time tested Papazian mantra. I relaxed, didn't worry and had... well not a homebrew as Papazian so rightly suggests, but the only thing on hand; presumably one of the plentiful and incomparable craft ales of the Pacific Northwest. This was after all my first batch. The next day another hydrometer was procured, and I don't know if hydrometers vary in their accuracy but this one read 1.011 as of 2/8/2012. I chalked it up to experience, assuming that as long as I was measuring on the same instrument, all that mattered was the difference between OG and FG. As long as I didn't break this new hydrometer, things should be fine. It was the first of many lesson's I have learned, and I know there will continue to be more and more as long as I care to go on creating the great libation. I primed the whole batch with 3/4 cup of corn sugar dissolved in 1 US pint of water and bottled on 2/11/2012. I projected the ABV at 4.07%, which in retrospect seems remarkably specific considering how many things went awry. After a patient 10 day wait, I tasted on 2/22/12. This gave way to another hilarious mistake. When bottling we ended up with one overspill, half-full 22oz bottle. This being non-standard, we decided to leave this one in the fridge. Needless to say, I learned a lot about yeast inhibition at lower temperatures that month. After a few minutes panic that conditioning had been a complete failure I relaxed, didn't worry and cracked open one of the bottles that had been fermenting in the closet. The satisfying release of CO2 upon removing the cap was all I needed to know this had been a success. It was dark, rich and if a little over-carbonated and diacetyl laden (lending a sweet butterscotch overtone), an otherwise excellent stab at a porter style, which would inform my next batch and give weight to my original recipe intention. Friends and family loved it and were intrigued. Perhaps this was partly because of the identity crisis it had; it was pretty hoppy and carbonated for a porter. But it was fun and encouraging and everyone wanted more. And perhaps most importantly, I knew I could do better. I bet every home brewer has some quirky story about how they got into the hobby, and I'm no different. Although less a story than merely a strange and unexpected call to action, there's still a little quirk in there. Somewhere in the region of five months ago (sadly I don't recall the exact day and locale) I was supping on a much favored tipple, Rogue Ales' delectable Hazelnut Brown Nectar. The conversation of the polite company in which I found myself naturally turned to gelato. This in turn led to me extolling the virtues of my favorite gelato flavor, pistachio. Zzzzap! My mind instantly leapt from the enjoyable conversation to the delicious nutty beer in my hand. There was some discussion as to people's knowledge of any kind of pistachio beer on the market. No one could think of any and a cursory Internet search (thank you smart phones!) yielded a negative. We pondered what beer would be best to complement pistachio. Obviously the gauntlet was down, and your lexically minded brew master made the snappy observation of the alliterative supremacy of a conceptual 'Pistachio Porter'. And thus a legendary quest was born, and here I am 5 months later with one revision of my Pistachio Porter down, and 7 other delectable creations having provided delight and succor for my friends and family. Now that I'm growing as a brewer (both in myself and my brewery) I am going to be moved to revisit and refine this original brew. Even if only by converting the recipe to all grain, I'd like to pay some tribute to the idea that inspired it all and who knows, maybe even create myself a flagship recipe in the process. The Pistachio Porter was but the second brew I attempted (the first being a strictly by the book newbie affair from a homebrew tome) and the recipe for it lives in my humble brewing journal. 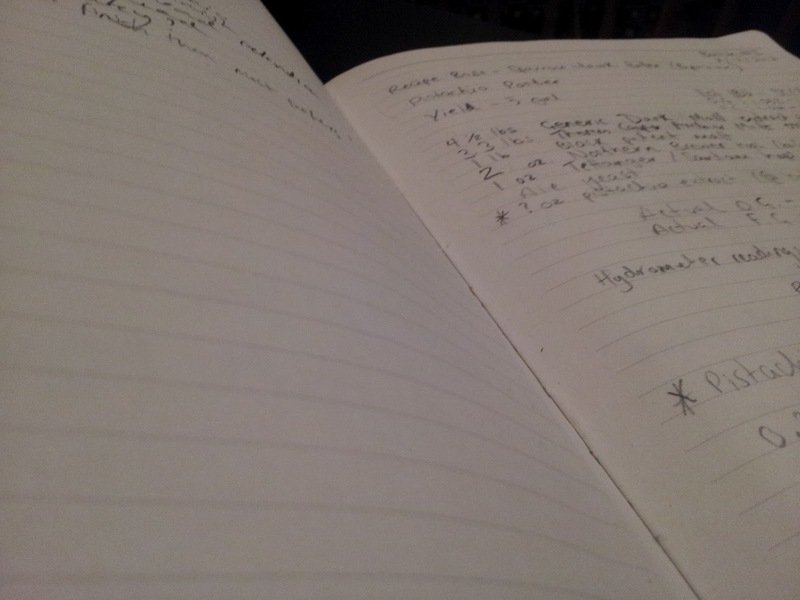 I've enjoyed my journal writing as a process of codifying my efforts, and I imagine its only going to be an advantage when I officially make the leap to the new brewing system I'm building (more on that in future posts). There's something to be said for the 'old' ways and it really has helped me order my thoughts and my brew day process. I'd like to take the time to share with you my experiences in extract brewing, so stay tuned for the odd post on each of my extract brewing endeavors in the coming weeks and months. I guess I'm a Puget Sound man at heart. There's something about the comfortable majesty and yet unforgiving, uncaring brutality of the body of water and its surroundings that speaks to me. There's something good and true about the act of hoisting a swarthy ale in celebration of its myriad charms, both gentle and raw. And what better ale to hoist than that made by mine own hand? To that end, I'm embarking on a journey into the realms of brewing finesse. I'm graduating out of the kitchen and onto a pilot 12 gallon system of my own making. I hope you'll join me, both in narrative, in spirit and for a well earned (and hopefully well made) beer as I set sail into uncharted waters and lose myself in the art of the perfect brew. Stay tuned for brewery build updates, brew day tales and batch information. I know I'm going to enjoy this, and I hope you will too. Drink the drink that I have made!